There are approximately one billion six hundred million Muslims worldwide. Muslims are one of the least evangelized people in the world. It is estimated that only 1% of the Western missionary force is endeavoring to reach Muslims, who comprise at least 39% of all un-evangelized people of the world. There is a great omission to the great commission, therefore fulfilling Jesus' commission is our motivation and goal. Today the mission field is not thousands of miles away, it's on our door-steps. Around 6 million Muslims have made the USA their home. They too need Jesus. The presence of Muslims in the United States is one of the greatest challenges and opportunities facing the Church today. 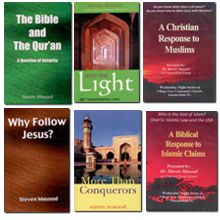 Providing leaflets, articles and helping Christians in outreach to Muslims. Distributing leaflets and booklets to help Muslims to know Jesus as the only way. Holding seminars at churches and fellowships. 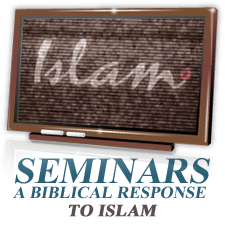 Helping Christians to communicate and dialogue with Muslims. Responding to Muslim and Christian inquiries. www.islamicfinder.com - On this website you can search for Islamic centers, schools, organizations and services in your city or by zip code. You can use this information to initiate contact with Muslims in your area. www.muslim-calendar.com -On this website you may locate Islamic events and festivals in your city or nearby. We encourage you to attend these events to talk to Muslims and to give them some of our leaflets or a copy of the New Testament and or the Jesus DVD Film.